The very name Skorpio dining table is provocative. It conjures a myriad of images from Zodiac signs to 70’s action films. 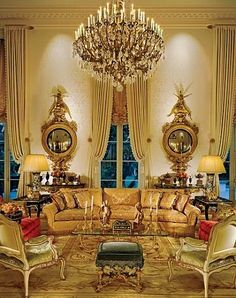 It’s a flashy contemporary moniker that’s not afraid to grab the attention of the discerning customer; not unlike the table. This piece races past traditional design composition to set a new place for itself in your home decor. 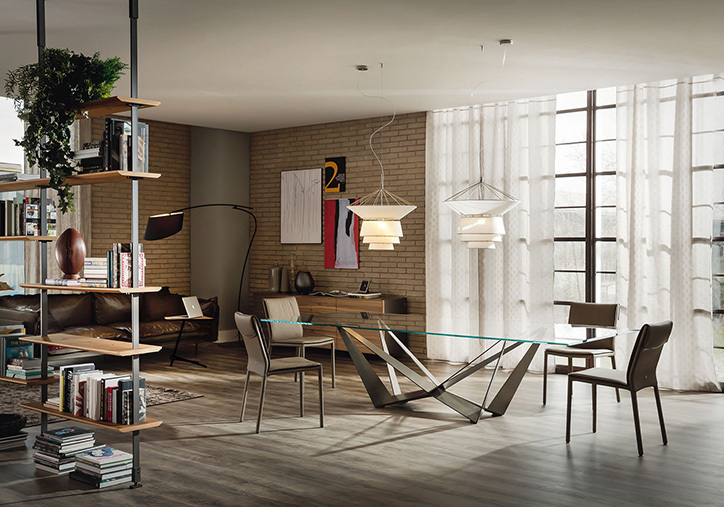 Like all creations by Cattelan Italia, it is visually defined by an effortless balance of quality composition and stylistic expectation. Giorgio Cattelan believes “furniture should be a way to experience time and life” and the Skorpio dining table epitomizes this ethos. The base makes a stunningly bold statement. 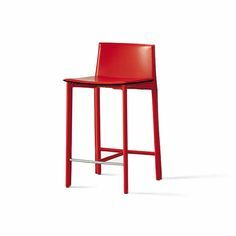 Available in 5 finishes including striking colors like orange fluo and graphite embossed lacquer, the angular power of this architectural support rises to cradle countless dining surface options. One of the most striking combinations is the more “organic” ferrous raw metal base paired with an 118″ x 47″ racetrack oval transparent glass top. Offset with matching Isabel dining chairs, this complete ensemble is the perfect setting for a gourmet dinner party or late-night cocktails that rage until dawn. Fourteen sizes, shapes and surface materials offered in a broad spectrum of opacities mean endless design solutions for your living space. 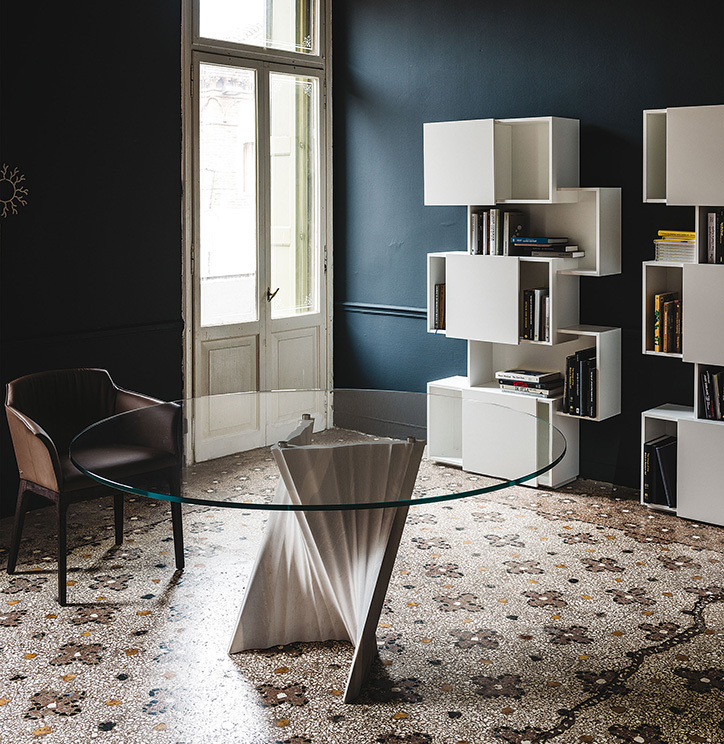 Eliot Keramik Table by Cattelan Italia is the quintessential example of this stylish design firm’s ability to create pieces of practical, lasting beauty. 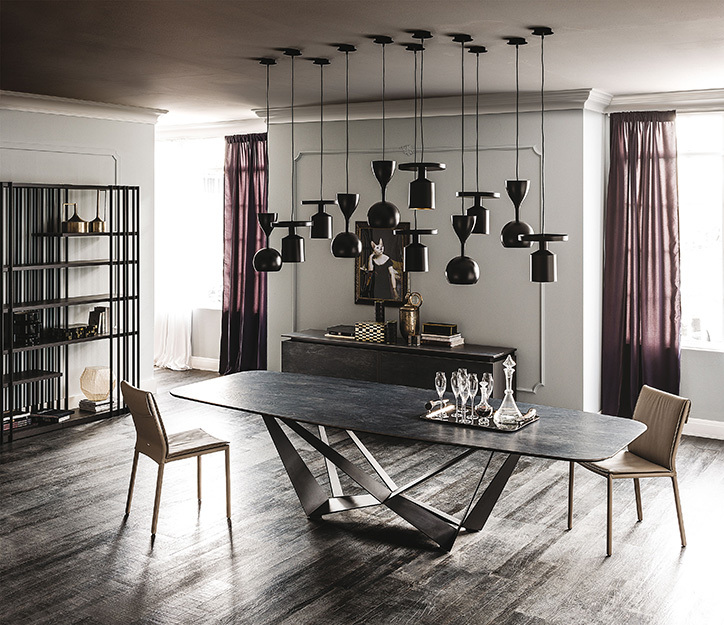 Featured prominently in Cattelan’s recent exhibition in Milan, this piece with its bold finishes is a stunning step forward in contemporary dining. Crafted in Marni ceramic, and offered in Ardesia, Alabastro or Calacatta colors, Giorgio Cattelan has combined a classic Italian setting surface with a sleek, modern, highly functional base. The ceramic in these textures is hardwearing while at the same time conveying a warmth and opulence. Proportionality is the secret to the flexibility of this piece. 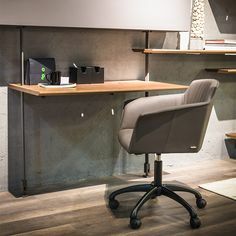 The elevation of the perfectly balanced, slim-line table surface is made possible by a painted steel base whose vault suggests modern architectural inspirations. The support underlying the Marni ceramic is virtually invisible giving the entire table a sense of effortless poise. The Eliot Keramik table is a timeless beauty of superb utility that sits as comfortably in the dining room as in the boardroom. 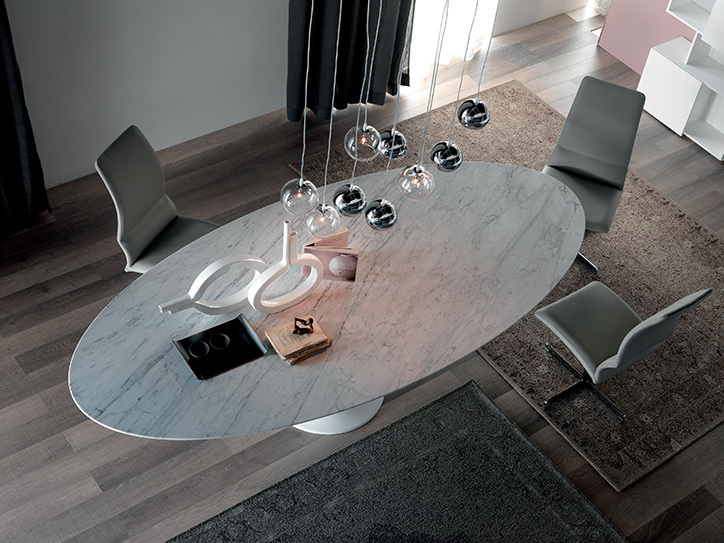 With all the natural allure of the coral from which the Reef Dining Table derives its name, combined with the the sleek elegance of blanched glamour, this refined piece by Cattelan Italia is sure to bring a poised simplicity and unflinching charm to any room it graces. 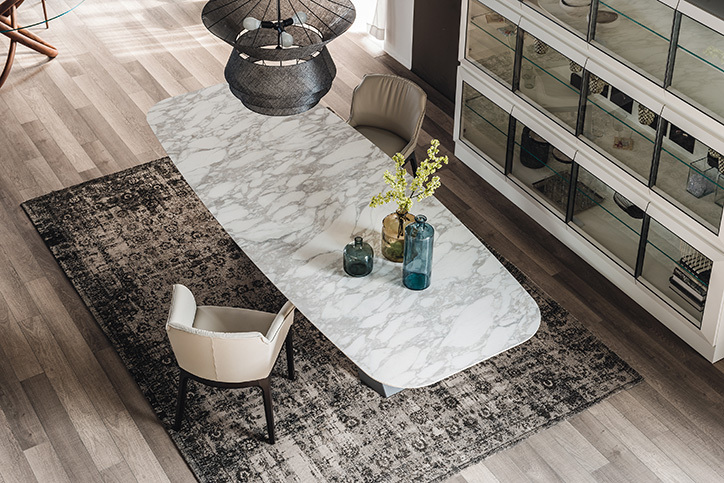 As smooth and polished as a pebble in the ocean, the streamlined design of the Reef table may seem straightforward, but at a glance it’s easy to see that it is a true masterpiece of the Cattelan Italia Dining Tables collection. Its understated boldness and its magnetic beauty tell the story. Featuring a superbly well crafted solid carrara marble or white embossed MDF top, and a tasteful, slanted Cristal plant base, the Reef table demonstrates a spirited, yet chic flare worthy of any smart living or working space. 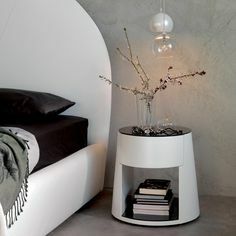 It is available in three different sizes as round or oval. In any combination, you are guaranteed all the beauty of the sea’s awe-inspiring coral reefs, with the strength and stamina of the tides themselves. 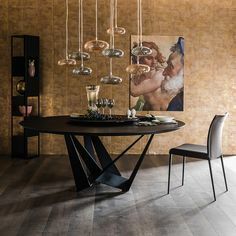 If you believe that you, your family and your guests deserve to enjoy both functional and uniquely stylish dining in your home, then take a close look at the Cattelan Italia Plisset Table. Like the rolling sands of a crisp wind-swept desert set against a clear glass-blue sky, so is the sleek-ridged and utterly elegant marble base of the Plisset Table set against the clear (or extra clear) glass finish of the tabletop. One can almost image Lawrence of Arabia returning home and bringing with him a new sense of suave design, seen through his newly expanded minds eye. That film, whose image the Plisset table evokes, was deemed “aesthetically significant”, so it’s no wonder that the table will feel aesthetically significant to the character of your dining room and home. 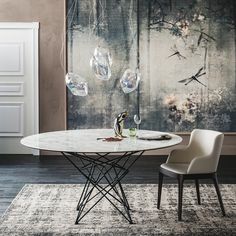 Made by Cattelan Italia, a company that has been at the forefront of sharp contemporary craftsmanship since the 70s, the Plisset table, which comes in a variety of shapes and sizes, satisfies both a desire for classic grace and modern vitality that would be a glamours addition to any graceful home. The Scorpio Keramik dining table weds two superb design concepts. 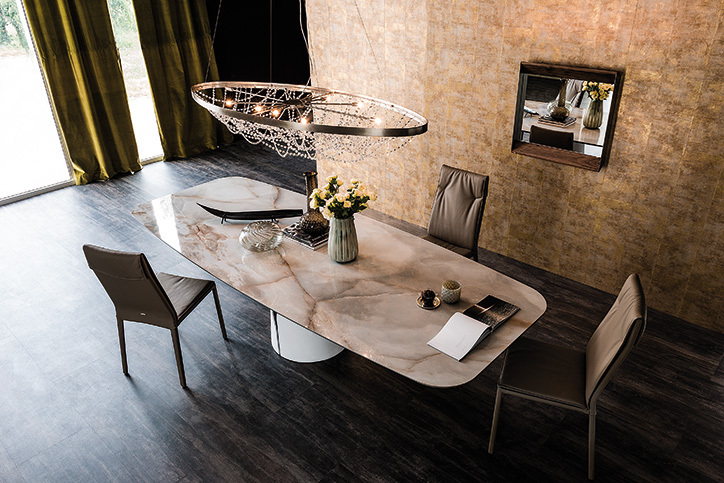 Envisioned by Andrea Lucattello for Cattelan Italia, this piece creates a luxurious focal point for formal dining engagements while being equally well prepared to take on the rigors of family life. 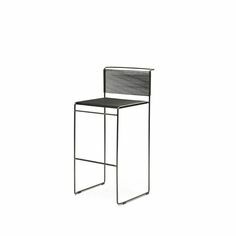 Available in 5 finishes that include striking colors like orange fluo and graphite embossed lacquer, the angular, architecturally inspired, bold base supports a classic Italian setting surface as sleek as it is strong. 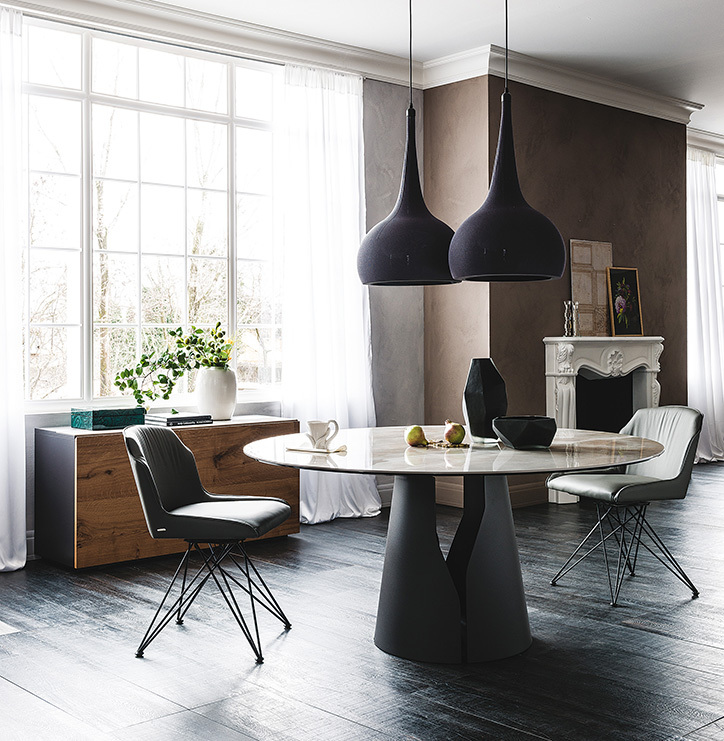 With Made in Italy quality, Cattelan Italia’s newest addition to the Skorpio dining collection, creates an added dimension of practicality with it’s innovative ceramic top finishes. The table top is composed of robust and highly durable Calcatta or Alabastro Marmi ceramic; a surface that resists staining, abrasions, or bending, and is effortless to clean. Beautiful and enduring, this pragmatic ceramic abounds with naturally occurring color, varied vein and compliments the cool metallic geometric base. 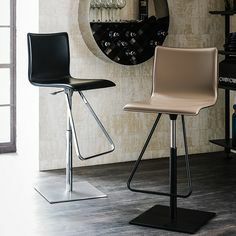 Pair this highly flexible centerpiece with a set of Maya Flex ML dining chairs and place this beside the Chelsea Sideboard for a complete contemporary dining experience as livable as it is visually impressive.